Eloise and I go way back. At about seven I discovered six-year-old Eloise. She was parent-free, running amuck in the Plaza New York and Paris, with her nanny, a pug and a turtle. I didn’t find it strange that Eloise exercised with champagne bottles, as my sister and I had hidden a bottle of Sweet Marsala under my bed. It was delectable topped with cream! When in Paris, Eloise insisted – if ‘ You cawn’t, cawn’t, cawn’t get a good cup of tea ’, you simply must devour a peach languishing in champagne. I was smitten. Originally Eloise was not intended for children. The first book was published in 1955 under the title, Eloise: A Book for Precocious Grown-ups. Later this was retitled as Eloise. Kay Thompson’s series, brilliantly illustrated by Hilary Knight, is still in print. I managed to find an original 1958 copy of Eloise in Paris. Published by Max Reinhardt, it retailed for the princely sum of twelve shillings and sixpence. On the back cover, there are comments from celebrities of the era. Nöel Coward states, ‘I adore Eloise’. The author, Kay Thompson, was a habitué of the Plaza Hotel. She had many talents and was a professional singer, vocal arranger, composer, musician, dancer and actress. When asked on whom Eloise was based upon, she answered, ‘I am Eloise ’. Most of the time, Eloise lives in luxury at the Plaza Hotel New York, at a time when the Plaza Hotel was considered the height of elegance and the haunt of the most fashionable and wealthy folk. Many artists and creatives hung out in the Plaza Hotel’s bar and restaurants. What is it that makes Eloise so damn appealing? For me it was the fact that she was essentially motherless, she lived in an adult world, didn’t attend boring schools and got away with pretty much everything. Eloise has Nanny to take care of her and Nanny is up for all manner of interesting adventures. As they travel the globe Eloise’s observations of society are astute and wickedly funny. Hilary Knight’s marvellous pen and wash drawings capture the curiosity and delight that Eloise brings to the adult world. Koki knows all the great places to go and he takes Nanny and Eloise on a picnic to the Bois de Boulogne. While Nanny drinks wine and recklessly plays with a flick knife, Koki plays guitar and Eloise dances wildly. Bliss. Small wonder that when I was a child I didn’t just adore Eloise, I wanted to be her. 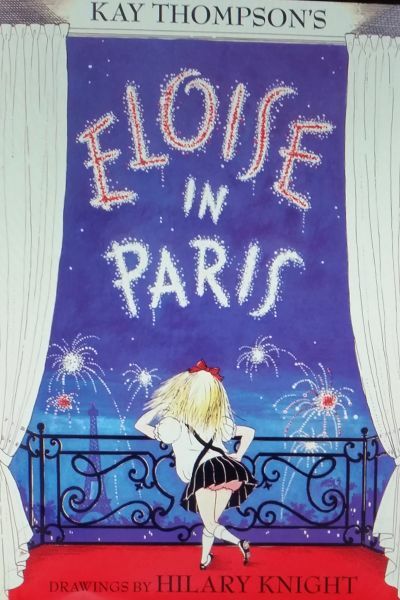 Photograph: Cover of ‘Eloise in Paris’ by Kay Thompson, illustrated by Hilary Knight.